May is shaping up to be a VERY busy month, so before things get crazy, I want to quickly blog about our unplanned April admission as well as offer a few new updates. For the most part it’s just the details surrounding our admission that I already posted on my social media accounts during the actual admission….so if you’re here just for the new updates, skip to the end (though I do talk about some things that weren’t included in those social media updates). On April 1st, Nick noticed this bump on the top half of Evanna’s sternotomy and it was even stretching her scar out. 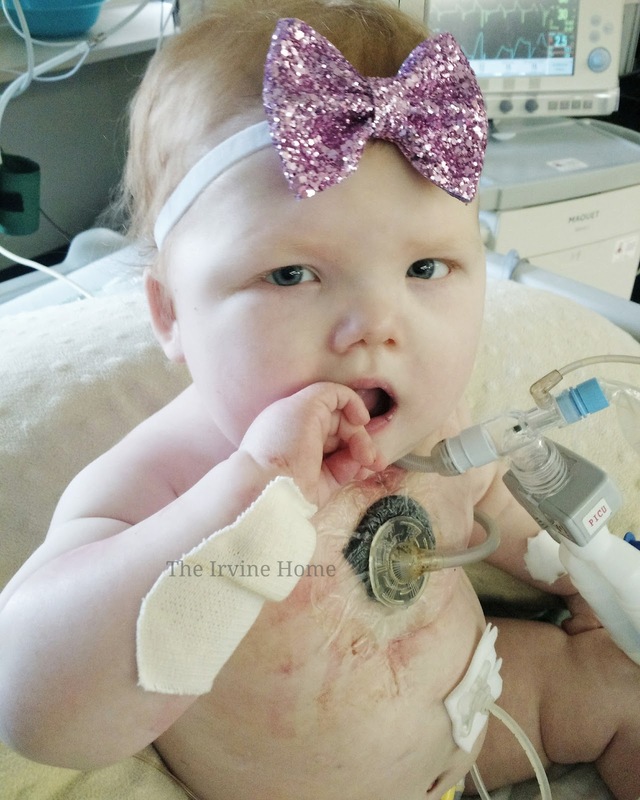 We immediately called cardiology, but because nothing else was wrong and it didn’t seem to bug Evanna, they chalked it up to a possible buildup of fluid (something that often happens in an area of scar tissue). The cardiologist just told us to keep a close eye on her, and to call them again if her situation worsens. We also had a planned ICU admission the following week, and so if they bump was still there, then the ICU medical team could thoroughly investigate it. 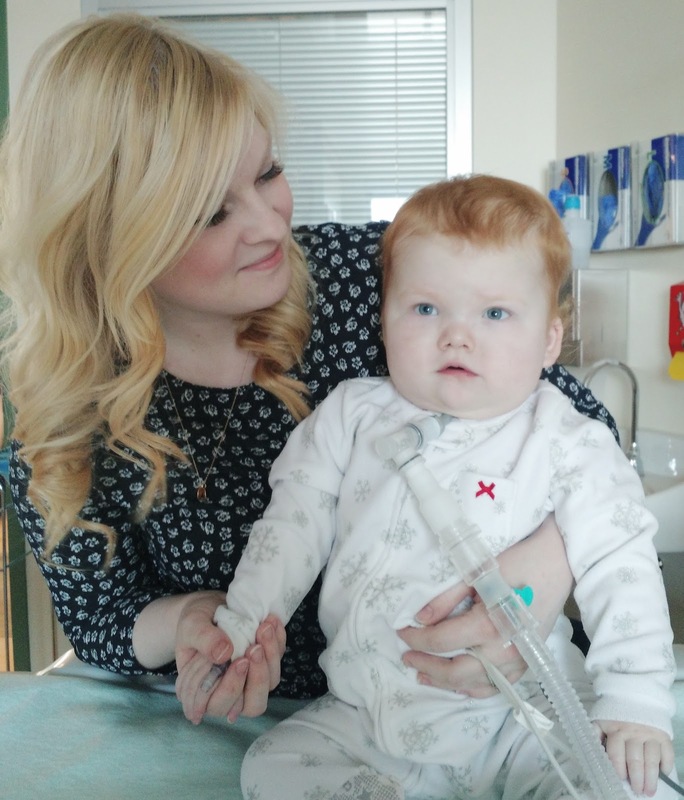 1 – we’re extremely eager to have our Calgary medical team see Evanna’s airway for themselves, as I feel it will ease their concerns about decreasing her ventilator settings and be more aggressive in weaning Evanna off the vent. 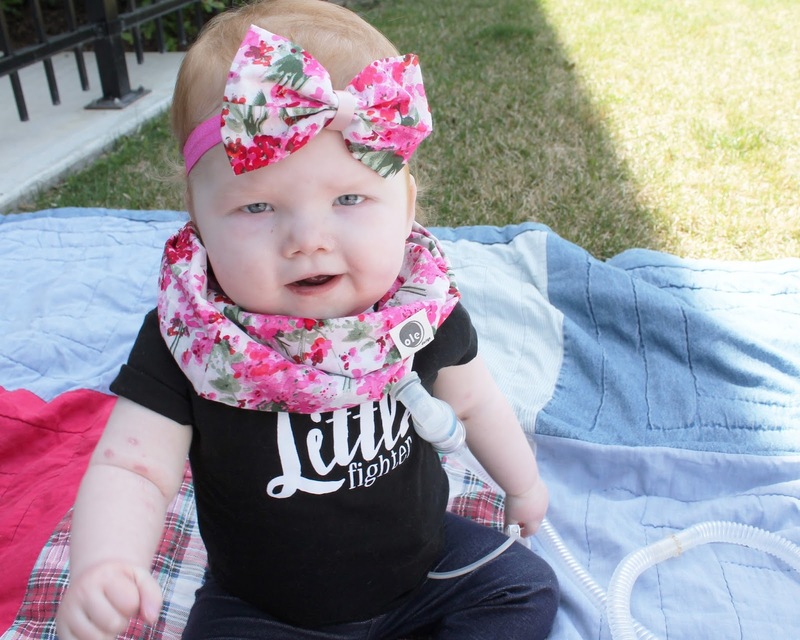 Our Edmonton ENT (Dr. Eksteen) who did Evanna’s tracheotomy back in March 2015 felt Evanna would only need the trach for 1 year based on the bronchs he did (as they produced somewhat decent results). I know the “one year timeline” will not be the case anymore (we’ve already surpassed the one year mark…lol), but they haven’t decreased her settings even ONCE since the initial surgery. I know Evanna getting sicker at one point after her tracheotomy didn’t help the situation (ie. her septic shock episode last July), and our goals were quite different last year then it is now (getting her on stable settings so we could just go HOME), but enough is enough. I’m in contact with a few families whose journeys echo our own and I find myself annoyed at how far behind we are (but absolutely thrilled at their progress as it gives me an idea where we’ll be someday). I know “every child is different”, but you also can’t go and ignore the similarities either. Their children are with months of Evanna’s age, either have exact or very similar heart defects, and also have 22q like Evanna. While Evanna has a handful more “medical events” attached to her, I feel we are very behind as to where we should be. Again, what’s frustrating is that the Calgary medical team doesn’t even have bronch results to go off (and yes, I’m confused as to why they haven’t looked at her Edmonton bronch tapes either), and other then getting to a stable point to go home, haven’t made a single step forward. While I’ve come to terms that we will be living the “trach life” for a few more years, decreasing setting and SPRINTING off the vent can make things so much easier and much more manageable for our family in the near future. 2 – have a medical professional look at this darn bump! 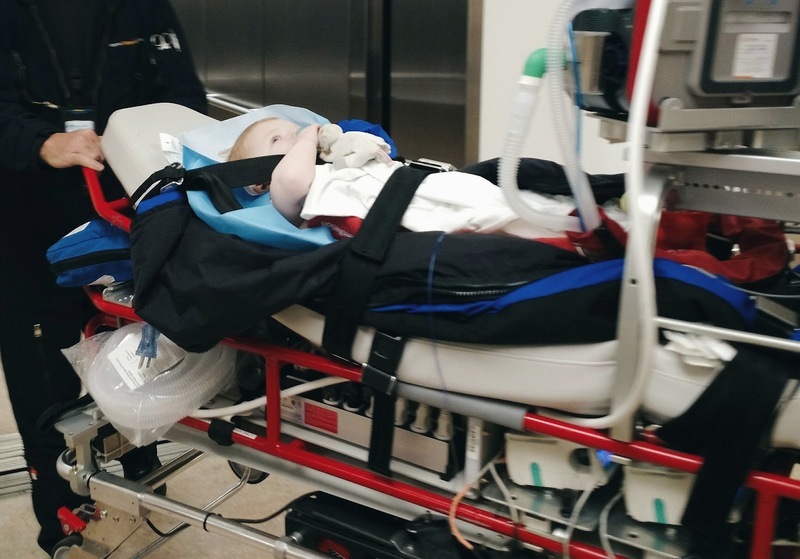 So after super, Nick and I discussed the current situation, and while Evanna was acting fine, we couldn’t ignore it anymore – especially because of it’s extremely close proximity to her trach (like I stated in last week’s blog post – you don’t mess around when it comes to the airway!) and we no longer had an opportunity to have a medical professional assess Evanna’s sternum. So we called the cardiologist on call again to inform him of our decision (which he understood and agreed with), packed Evanna up and drove directly to the emergency at the Alberta Children’s Hospital. We actually were kind of joking on the way there that “if Calgary wasn’t going to give us a bed…we were going to take one instead”. With Evanna being so stable, I expected to be treated somewhat like a regular family and “wait our turn”, but after being triaged, we were immediately taken to the back and seen by the ER Pediatrician within 5 minutes (cardiac + trach + vent = VIP treatment regardless of our status apparently). We were told that we made the right decision to bring Evanna in (we’ve spent more than our fair share of time in hospital, and with the resources we have access to at home, we never want to be at the hospital when we don’t have to be – so it was somewhat an “internal struggle” on what we should do), and we were informed they would indeed admit Evanna. 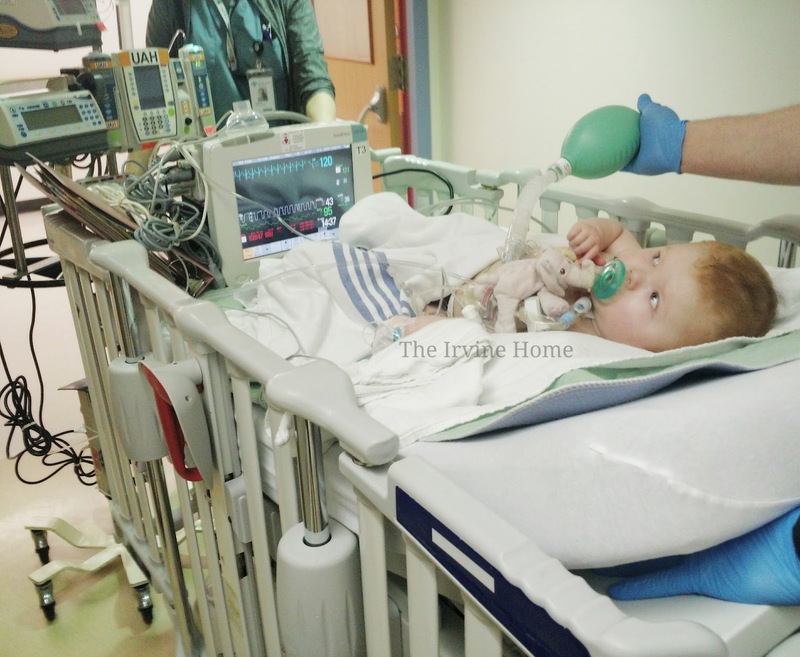 They did consult with the PICU as per trach/vent protocol, but with Evanna being so stable meant the intensivist couldn’t justify an ICU bed at that point in time, and we could precede with going to the unit instead! We did have to wait for a bed to clear in the “vent hallway”, so though we brought Evanna in around 8pm, we couldn’t transfer to the unit til 3am after some patient shuffling could take place. On Tuesday (April 5th) they did an ultrasound to confirm a buildup of something (fyi – not one lab result came back with a positive infection throughout our entire admission), and decided to proceed with a CT the next day to see how deep it was. Though an Edmonton transfer was lightly mentioned in passing if the infection was deep enough, based on Evanna’s “clinical and stable status”, we didn’t think that much into it (besides – those days were behind us – right??). However, after the CT on Wednesday, they consulted with the cardiac surgeons in Edmonton, and all of a sudden things went from 0 – 60 and a transfer was immediately planned. I quickly called the Ronald McDonald House to put my name on the waiting list, but fortunately they had one of their single rooms available and was told I could check in the moment I arrived (we’re a “returning family”, and so we don’t have to go through the normal check-in process). I then called my boss to let her know that I would be away for a little while, and would keep in her informed of when I could return to work. Finally after calling my parents, the transport nurse and RT from ACH’s PICU came up and began to pack Evanna into the stretcher for transfer, while we emptied her room (the unit charge nurse mentioned that this was the fastest nonemergency transfer that she’s ever seen!). Once the transfer team left (with instructions on how to keep Evanna happy throughout the flight – movies, soothers, and her favorite toy… suction catheter wrappers! ), Nick and I quickly drove back to our house so I could pack (Nick actually stayed behind as he had to work, and in all reality, Evanna was not “sick/critical”, and this situation is somewhat normal to us). I was back on the road driving up to Edmonton within 45 minutes, and finally had a moment to process our evening and all the events that had just occurred. I arrived in Edmonton just before midnight, and after checking into the Ronald McDonald House (basically I just signed in to get our room keys), I raced over to the Stollery Children’s Hospital to see how the transfer went, and how Evanna was settling in. When I walked onto the unit, the nurses were trying to get some blood out of her scalp and Evanna was one very angry baby (I would be too if someone was sticking needles in my head...poor girl). Once they were done, one of the fellows (who I just love), came over to talk about the plan and ask about her current medications, as they haven’t seen her since last June! He then informed me that Evanna would be an “add on” for surgery the next day (which we really weren’t expecting), and then he marveled at how big and “great” Evanna looked. The last time that he and all the Stollery nurses saw Evanna, was last year when Evanna was still incredibly sick, so they just couldn’t believe how good she looked despite our readmission to the PCICU. Once things settled down, I decided to finally leave and get a little sleep, as I knew the next day would be a long one. On Thursday (April 7th – our wedding anniversary no less), the day started out with catching up with some of my favorite intensivists, nurses and RT’s. I truly consider the Stollery PCICU my second home, as I practically lived there for over 8 months, and the staff have truly become like family. 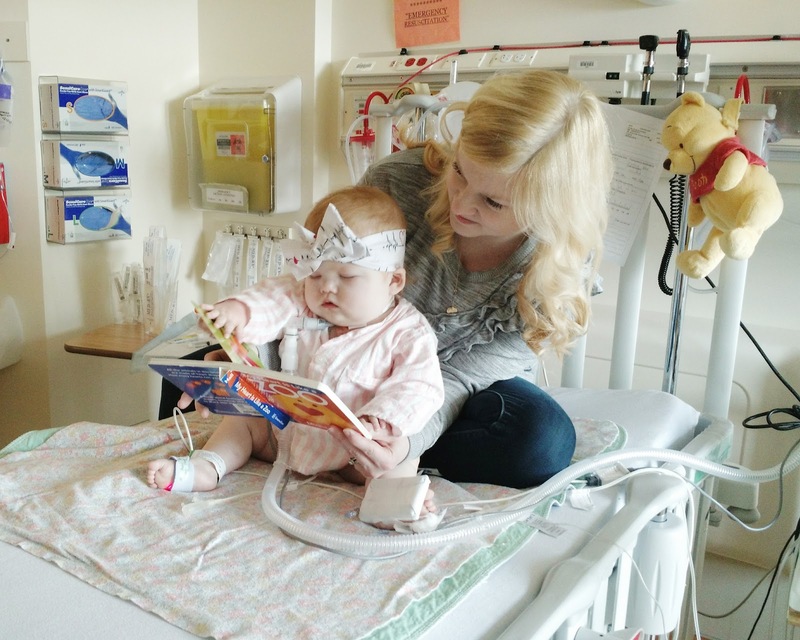 As people began to learn about our readmission, they would pop over to say hi and be in disbelief at how much Evanna has grown and developed. When Nick came up later that weekend, he joked that I was having way too much fun and could tell that I was in my “element” (such a “medical mama” trait). Later that afternoon, Dr. Ross & Dr. Al-Aklabi took Evanna back into the OR (as our primary cardiac surgeon Dr. Rebeyka was away, but I adore Dr. Ross and Dr. Al-Aklabu just as much, so I didn’t mind that they were doing the surgery). 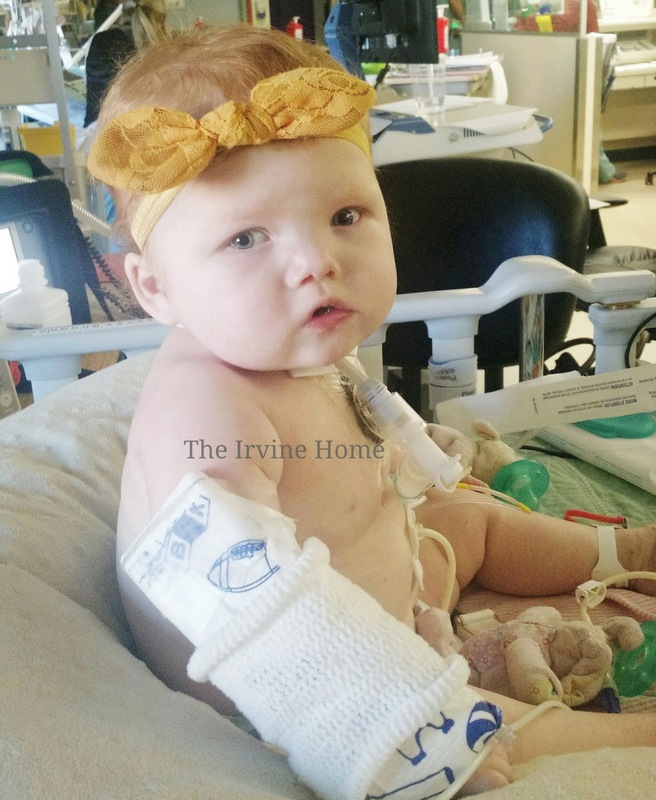 They opened up the bottom bump, cleaned it out, and then tunneled upwards to drain it (with the second bump being so close to Evanna’s trach, they didn’t want to actually cut up into that area). Overall, the total procedure took about 20 minutes and she was back into the PCICU in under an hour. One of my dear friends who lives in Edmonton arrived around the same time Evanna got back from the OR, and once Evanna was settled (she was kept sedated), she took me out for dinner to help celebrate my anniversary (as again, Nick stayed back in Calgary) which I greatly appreciated! 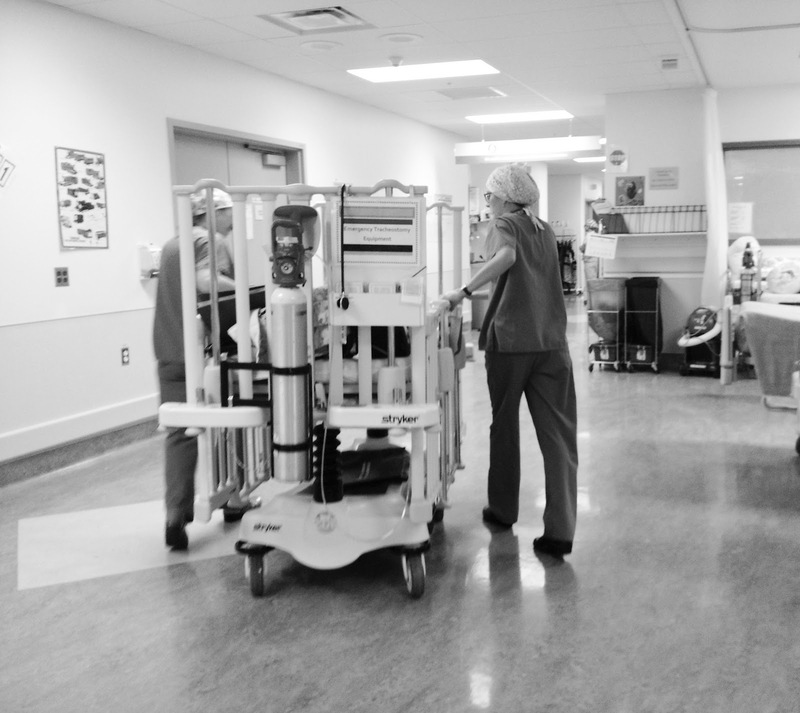 Friday (April 8th) entry: Just like a NORMAL ICU stay should be, things are progressed quite quickly »» which was a concept Evanna could never grasp the first time around lol. - They took down the surgical dressing and added a "wound vac" (the black thing you see on Evanna's chest). This is suppose to aid and speed up the process of healing. - Her morphine infusion was discontinued that morning and she's was just on Advil & Tylenol around the clock -- which is just amazing in itself (it took a year before we could finally get Evanna off sedation medication last year). - Infectious Disease decided that because all her labs came back negative, to take away the two major IV antibiotics and just leave her on one. This was been the MAJOR topic of discussion, as they have decided to officially call it "soft tissue mediastinitis", but because it didn't hit bone, they can put her on a more gentle antibiotic. HOWEVER, because of that diagnosis, they decided that she WILL be on a 6 wk antibiotic course. - This means that when they are able to (which might have to wait til Monday), they want to insert a PICC line for this purpose, as peripheral IV's don't last very long. - She is back on FULL feeds, and almost back to her bolus baseline. - By the end of the day, she was back in her HOME VENT, which was just fantastic. - They will do a wound vac change on Monday and then again on Wednesday. Hopefully after that we can see about transferring Evanna back to Calgary. Our weekend in the PCICU was fairly boring (though we did take a quick moment to ourselves to celebrate our anniversary), and the following Monday they inserted a PICC line for the IV antibiotics (with our primary intensivists Dr. Cave acting as the anesthesiologist). Dr. Rebeyka had returned to work, and after giving him a quick hug to wish him Happy Birthday (yes, that it how well I know the man lol), we briefly discussed Evanna’s future and what he would like to see done. While they had hoped to transfer us up to the ward at one point, due to no beds, we ended up just hanging out in the PCICU until we were stable enough to transfer back to Calgary. Nick and Evanna so happy to be reunited! On Thursday (April 14th) they were finally able to secure a bed on Unit 2 for Evanna at ACH, so they transferred her back to Calgary. 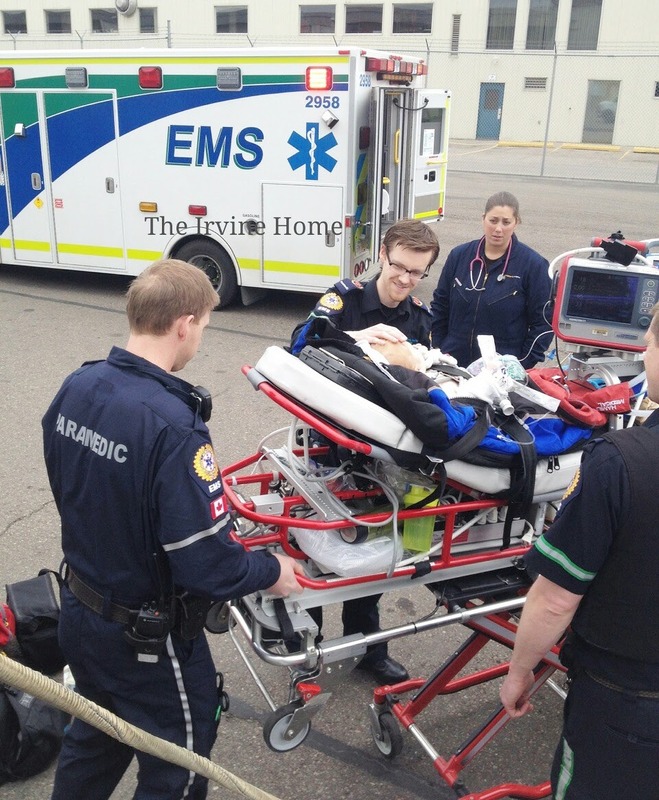 Coincidently Nick happened to be working that day, and so he actually got to help pick Evanna up (EMS isn’t really responsible for the patient and parents go on transfers all the time – just like I did last summer). 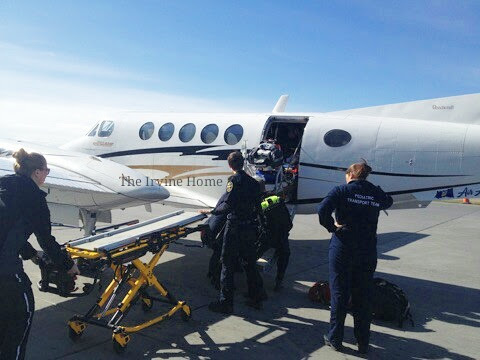 I arrived about an hour later as I had to drive our vehicle back to Calgary, and once she was completely settled and our regular homecare nurse arrived for the night, I left to unpack and get some sleep. The week following our transfer back to ACH was filled with some ups and downs as Evanna's wound didn’t heal as quickly as we had hoped (so plastic surgery became a regular visitor), but once we were able to switch Evanna over to her oral antibiotics, we were given the go ahead to take Evanna home on Friday April 22 promising that we would bring her back if things continued to not improve. While her chest wound is still not 100% perfect to this day, it remains manageable (cardiology and plastics have seen it during our regular appointments since our discharge) and her antibiotic course will end around May 22 (if I remember correctly). - during our admission, after consulting with both our dietician and the Stollery PCICU dietician (whom I just adore), we’ve decided to switch Evanna from a formula based diet to a “blended food” diet, as she isn't getting the appropiate amount of protien. 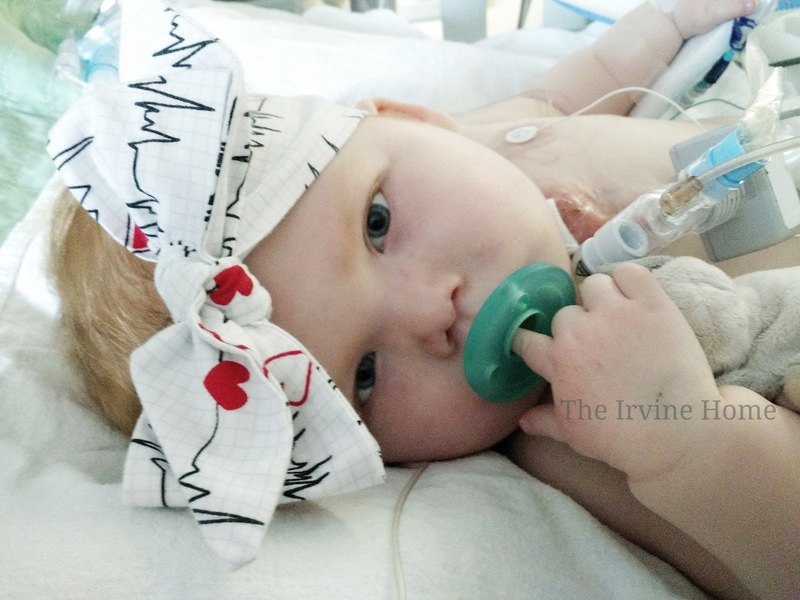 We’re still very much on a diluted concentration based on how much support Evanna receives from her home ventilator, but hopefully over time as we wean her off the ventilator, that will also change. 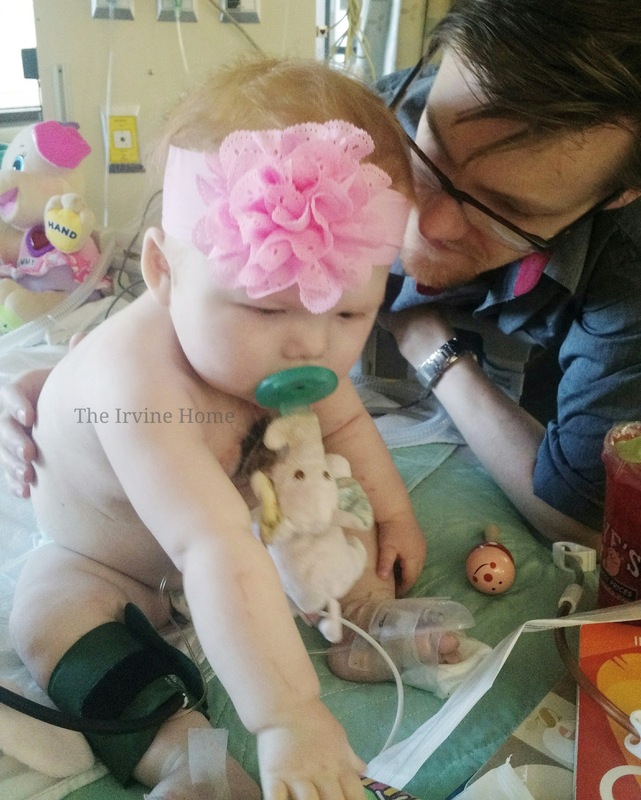 - Evanna is continuing to do very well in her physical therapy progress. She can sit up without any support (though we still have to place her in that position…so we’re working on that), but she’s such a little turkey anout it – unless she can watch a movie or be VERY distracted (funny enough, me taking her picture is one of those instances), she refuses to sit “just cause” lol. Basically, if we want her to work hard, she wants to be rewarded for it. We’ve made huge gains with her standing frame. In the fall, she could barely handle 10 minutes in her standing frame, and would cry and desat, forcing us to take her out. Now, it only takes one person to put her in (where it use to take the two of us), and she now can easily surpass the 1 hour mark. This also reflects in how well she does in the exersauser – she now can twist and turn super easy (which unfortunately causes her to get tangled up with the vent tubing from time to time), and loves to bounce in it. I’m trying to get Evanna to put weight on her feet on her own, but at the moment, she has no interest…so I’ll just have to keep trying. The other main thing we’ve been working on is gaining shoulder strength, as that will lead to crawling and gaining more independence down the road. - last week Evanna had another FEES test. This is where our ENT inserts a scope (with a camera at the end) to see essentially see what Evanna’s throat looks like. While there has been marked improvement since the December FEES test, unfortunately we have not been given the go ahead to be more aggressive in her feeding therapy. While our ENT is still okay with taste therapy, that’s about all we can do for now. He stated that Evanna somewhat “refusing to eat” is kind of an “instinctual” thing, and basically it’s like she knows it’s not safe to eat. He also informed us that Evanna is now getting to big for the FEES test, and we now need to get to a place where Evanna will willingly swallow so we can do a barium swallow study….so basically we have our work cut out for us for the next while. - the bronch! So like I talked about earlier, this has been the BIGGEST focus and topic of discussion for the past few months. We are eager to actually start making gains in Evanna’s ventilator weans, and so the bronch cancellation was a huge blow for me. It has now been rescheduled, and it will actually take place next Monday (May 16th)! I am very confident that this one will not be cancelled as there has been better communication between all the different disciplines, and this procedure has been recognized as a necessity. This will be our first one since our main discharge, so I have no idea what to expect (and no one knows how Evanna will handle it), so I’m not quite sure how long we will be in hospital for. My best guess is 2-3 days, with the first night definitely being in ICU (as getting an ICU bed has been the biggest hold up). So PRAYERS for a good bronch that will show the Calgary medical team that Evanna is strong and very ready for some significant changes! I of course will keep everyone updated and informed of what happens while we are in hospital through Instagram and Facebook updates! 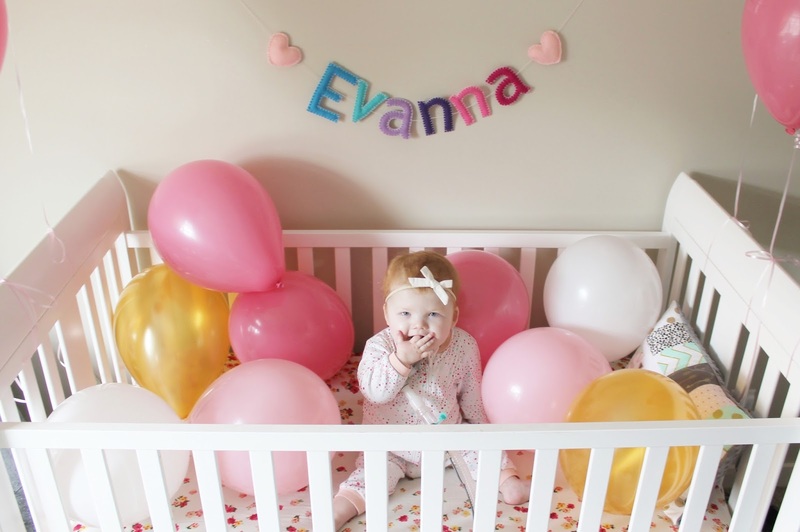 - on a nonmedical front, I’m busy getting ready for Evanna’s birthday party at the end of the month, and when I quickly drove by our new house last week, I saw that they have finished with installing all the drywall and it’s already been “taped and mudded”. We still don’t have a possession date, but my best guess is still July. I’ve been working lots and life has just been plain busy! She is adorable!!! Praying for an awesome bronch. We are going through a lot of the same stuff, though not the bump. Big hugs!